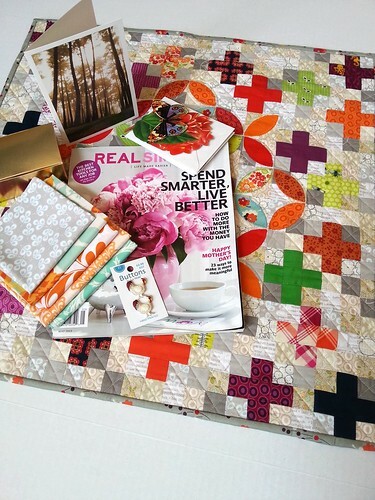 First off, the winners from the Quiltmaker 100 Blocks Giveaway are: Julie C, the momma, and Blue.Ridge.Girl. You three should already have an email from me in your inbox. Congratulations! And a big Thanks to all who entered and left me such nice comments! 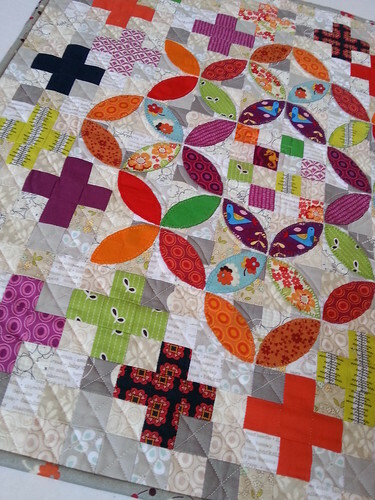 I have been impatiently waiting for my FLiQS quilt to arrive for a few weeks now. Seems I got the mail date a bit wrong, which means I was the first to send out my quilt and one of the last to receive one. That was a hard wait. Thankfully my wait is over! This beauty was made for me by Donna. I was so blown away when I opened up my package that I might have even let out an audible gasp. She incorporated so many of the things I said I loved: orange peels, pluses, low volume, tiny piecing, Denyse Schmidt, and Heather Ross. Each square is a mere 1" finished with the whole quilt measuring 24" square. Even the back is cool. 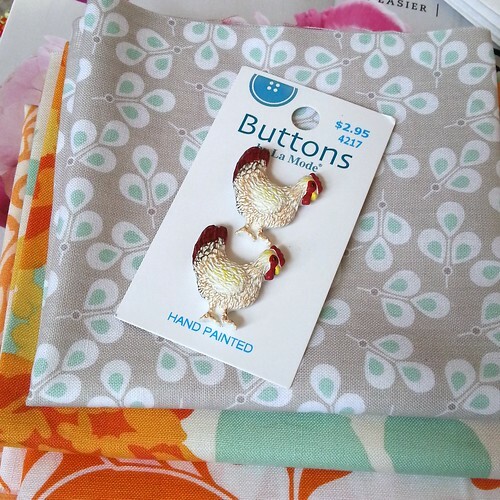 She sent along some fab little extras as well. I'm telling you she stalked me very well. See those fabrics? They are perfect for my new bee. She definitely did her homework. Again, Thanks to Donna! It is a treasure, for sure. Next week I'll show my new additions hanging with their friends. Emily thank you so much for hosting the Quiltmaker's 100 Blocks give-away! 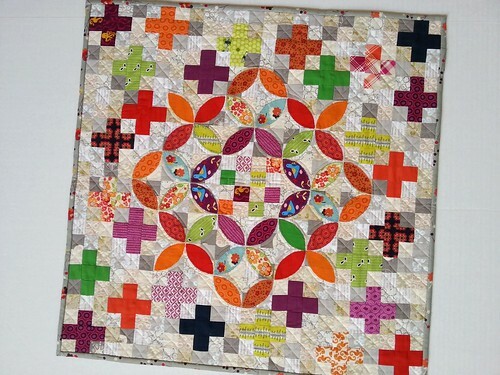 I am so excited to win a copy :o) I plan on making your block, Red is Neutral, to put in the Random Sampler quilt I'm working on. You did receive a beauty in th FLiQS swap!! Lucky you!! It really is a fabulous quilt. Lucky you!